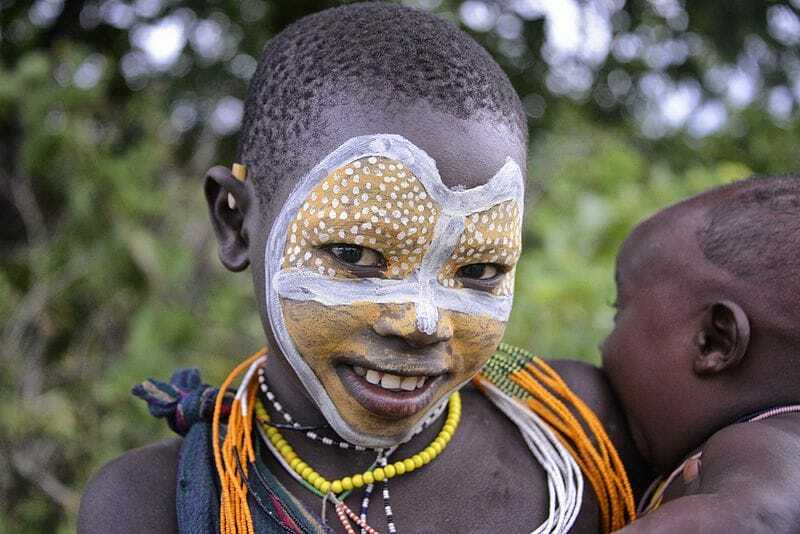 A fabulous tour into the heart of the Surma tribal lands in the Upper Omo Valley and the Suri people who live along the seldom-visited western bank of the Omo River. 5 Days / 4 Nights OR 4 Days / 3 nights (whichever way we can get 6 participants, which is the minimum number. Max number = 8). As of now, we are looking at February 23, 2018, as the start date of this trip, though we can be somewhat flexible. To avoid the risk of rains, best to avoid travel here from March onwards. 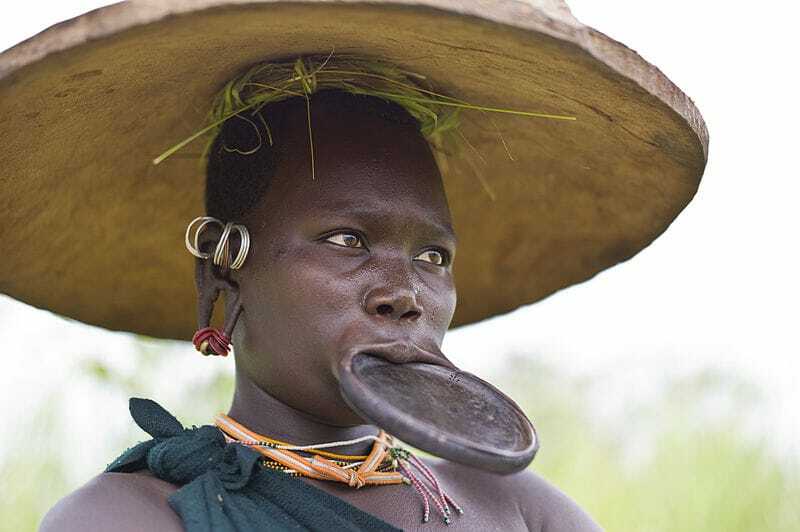 US$ 3900 pp for a 4-day / 3-night trip plus the scenic Gambella flight. This quote includes return charter flights from Addis-Mizan Teferi-Gambella-Addis, private guide, vehicle on-site, local guide and scout fees, plus all-inclusive luxury mobile camping. It does not include photos, tipping, personal expenses or services in Addis. Our Omo trip is an abbreviated one and visits only the Upper Omo Valley. By car, it takes 3 days (driving 8 hours/day) to get to the Upper Omo Valley from Addis Ababa and this possibly explains why this remote region is not usually included in the more commonly-visited Omo Valley itineraries that cover the many other tribes that live to the east of the Omo River. 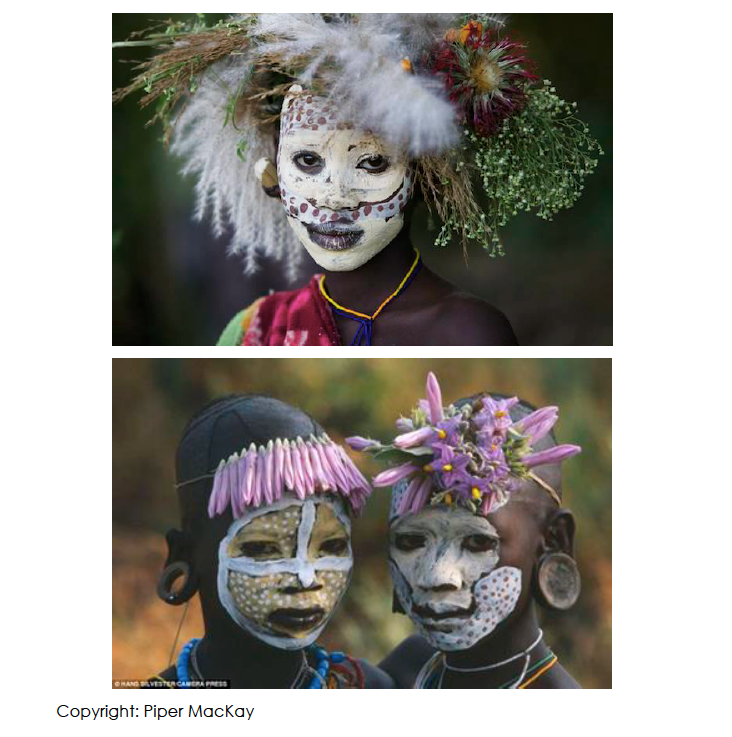 We understand that some people feel that it is intrusive and uncomfortable to take staged photos of tribal people. My feeling is that these people are some of the best and most original body artists EVER! They deserve to be paid for their work and their art deserves to be kept alive. And a certain amount of commercialization is probably the only way to do this. So think of yourselves as Patrons of the Arts instead of as voyeurs – because that is what you really are. 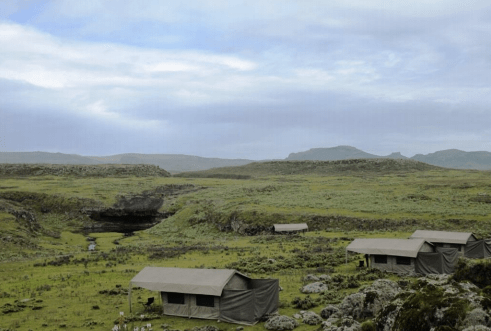 On this tour, we will be staying in mobile camps in the Upper Omo Valley. 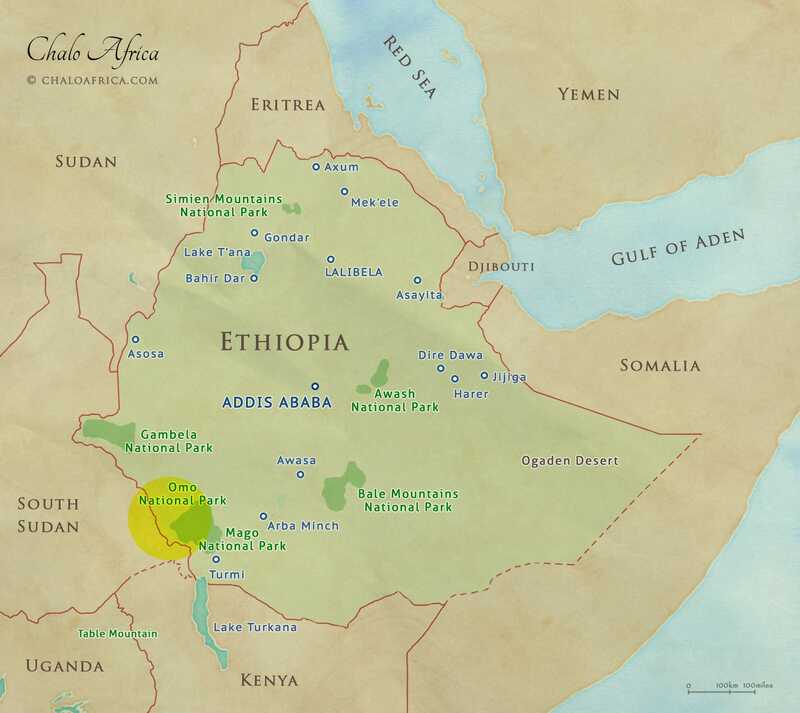 The area you will be visiting (highlighted in yellow) is in south-west Ethiopia, bordering South Sudan. Gambella NP abuts and adjoins Boma NP in South Sudan. Boma is home to the recently discovered second-largest migration of ungulates in Africa and this is the land of the white-eared kob, Mongalla gazelles, the famed Nile lechwe, huge herds of tiang and roan, not to mention all manner of other birds and beasts. Gambella National Park, adjoining Boma NP. At certain times of the year, vast numbers of these ungulates congregate in the Duma Wetlands area of Gambella NP in Ethiopia. This is a very remote area, in the deep interior of the park, and there are no roads to get there. 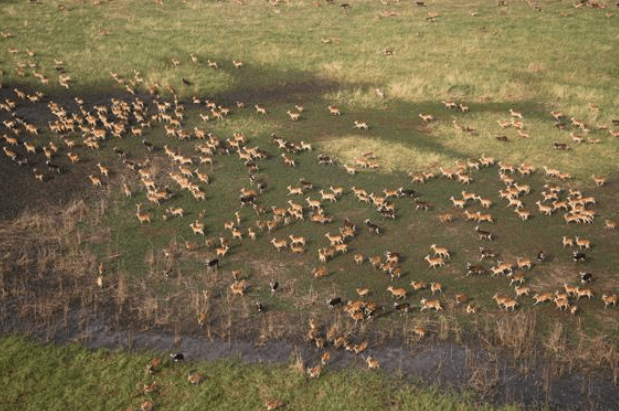 The best way to see Gambella would be in a heli that can land at will in safe areas, and from there you can observe the animals. However, helicopters are very expensive, especially considering that it can carry only 3-4 people at any given time. This safari begins and ends in Addis Ababa, Ethiopia. We recommend flying Ethiopian Airlines into the country.